To Cite: Goudarzi H, Aghamohammad S, Hashemi A, Nikmanesh B, Noori M. Distribution of blaTEM, blaSHV and blaCTX-M Genes Among Escherichia coli Isolates Causing Urinary Tract Infection in Children, Arch Clin Infect Dis. 2013 ; 8(3):e16207. doi: 10.5812/archcid.16207. Background: Emerging antibacterial resistance rates and extended-spectrum-β-lactamase producing Escherichia coli recovered from urinary tract infections (UTI) is an increasing problem in different regions, limiting therapeutic options. Objectives: The aim of this study was the detection of blaTEM, blaSHV and blaCTX-M genes among Escherichia coli strains causing Urinary Tract Infection in children from Iran. Materials and Methods: A total of 100 Escherichia coli isolates were collected from urine specimens of patients with UTI who had referred to the Children Medical Center, Tehran, Iran between November 2012 and July 2013. Antibiotic susceptibility test was performed by Kirby-Bauer disc diffusion method according to CLSI guidelines. The blaCTX-M, blaTEM and blaSHV genes were detected by PCR and sequencing methods. Results: The resistance rate of isolates to cefotaxime, ceftazidime, imipenem, gentamicin, amikacin, cefepime, piperacillin/tazobactam, co-trimoxazole, nitrofurantoin, cefixime and cephalothin, were 51 (51%), 24 (24%), 0 (0%), 25 (25%), 2 (2%), 6 (6%), 2 (2%), 79 (79%), 7 (7%), 36 (36%) and 43 (43%), respectively. In this study, imipenem was more active than other antibiotics. The existence of blaTEM-1 and blaCTX-M-15 was detected in 69 (69%) and 74 (74%) isolates respectively, while blaSHV gene was not detected. Conclusions: The prevalence of β-lactamase-producing genes in E. coli detected by this study is of great concern and highlights the need of infection control measures including antibacterial management and prompt identification of isolates with beta-lactamase-producing genes. Urinary tract infection (UTI) is one of the most important causes of mortality and morbidity in children. Early diagnosis and suitable antimicrobial treatment are required to minimize renal scarring and severe kidney damage. In children with suspected UTI, drug treatment is usually started experimentally, before urine culture results are provided (1). Unfortunately, antibiotic resistance has become an increasingly major problem in Iran. In some countries, many child mortalities occur as a result of Multi-Drug Resistant (MDR) bacteria (2). Escherichia coli is the most frequent pathogen isolated from 50 – 90% of all uncomplicated urinary tract infections (3). UTIs caused by extended-spectrum-beta-lactamases (ESBLs)-producing Escherichia coli have become a growing problem worldwide (4). E. coli producing ESBLs are reported mainly in children and adult urinary samples and are believed to cause infection due to their resistance to many antibiotics. ESBLs are a rapidly evolving group of β-lactamases produced by E. coli isolates. These enzymes have the ability to hydrolyze cephalosporins and aztreonam but are inhibited by β-lactamase inhibitors such as clavulanic acid. ESBLs are often located on plasmids and many of them are derived from mutations in blaSHV (Sulphydryl variable) and blaTEM (Temoneira) genes determined by amino acid substitutions around the active site. Apart from SHV and TEM types, E. coli isolates may additionally produce CTX-M (Cefotaximase-Munchen) enzymes. CTX-M β-lactamases are more active against cefotaxime and ceftriaxone than against ceftazidime, even though point mutations can increase their activity against ceftazidime as well (5). Rapid and correct ESBL detection is important for infection control measures and for choosing the appropriate antimicrobial therapy (6). The aim of this study was the determination of the frequency of blaTEM, blaSHV and blaCTX-M type genes among E. coli isolates from hospitalized patients in the Children Medical Center, Tehran, Iran during years 2012 and 2013. The study population consisted of all patients (20 hospitalized and 80 community acquired), with positive urine cultures with a colony count of ≥ 105 colony forming units per milliliter for midstream urine samples and ≥ 104 for samples collected by catheter from infants and small children with UTI, who had referred to the Children Medical Center, Tehran, Iran between November 2012 and July 2013. The isolates were biochemically identified based on the colony morphology on blood agar, MacConkey agar and the isolates were identified by conventional biochemical methods (3). Antimicrobial susceptibility to imipenem (IPM: 10 μg), ceftazidime (CAZ: 30 μg), cefotaxime (CTX: 30 μg), amikacin (AN: 30 μg), piperacillin/tazobactam (PTZ: 100/10 μg), cefepime (FEP: 30 μg), trimethoprim-sulfamethoxazole (TS, 2.5 μg), nitrofurantoin (FM: 300μg), cephalothin (CF: 30 μg), cefixime (CFM: 5 μg) and gentamicin (GEN: 10 μg), all purchased from Mast Group, Merseyside, UK was performed by the Kirby-Bauer disk diffusion method on Mueller Hinton agar (Merck, Germany) based on Clinical Laboratory Standards Institute (CLSI) guidelines, 2012 (7). E. coli ATCC 29522 were used as control strains. Total DNAs of the different bacterial isolates were extracted by the DNA extraction kit (Bioneer Company, Korea). PCR method was used for screening of the blaTEM, blaSHV and blaCTX-M genes. The primers used for TEM, SHV and CTX-M were as follows: TEM-F (5'-TCGGGGAAATGTGCGCG-3') and TEM-R (5'-TGCTTAATCAGTGAGGCACC-3') for TEM; and SHV-F (5'-TTAGCGTTCCCAGTGCTC -3') and SHV-R (5'– GGTTATGCGTTATATTCGCC-3 ') for SHV; CTX-M-F (5'-TTTGCGATGTGCAGTACCAGTAA-3') and CTX-M-R (5'-CGCTATCGTTGGTGGTGCCATA -3') for CTX-M. Amplification was carried out with the following thermal cycling conditions: 5 minutes at 94°C and 36 cycles of amplification consisting of 1 minute at 94°C, 1 minute at 55°C, and 1 minute at 72°C, with 5 minutes at 72°C for the final extension. 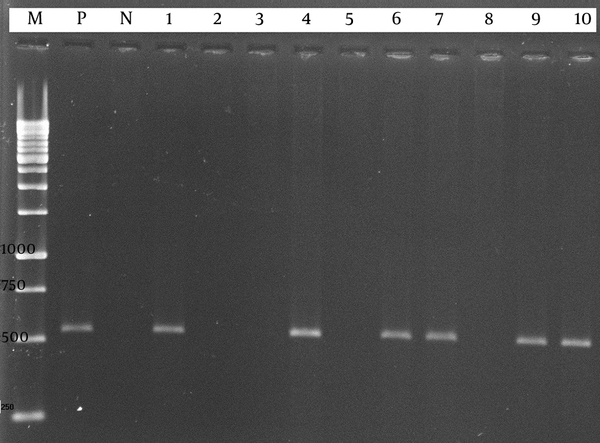 PCR product bands were analyzed after electrophoresis in a 1% agarose gel at 95 V for 45 minutes in 1X TBE containing ethidium bromide under UV irradiation. 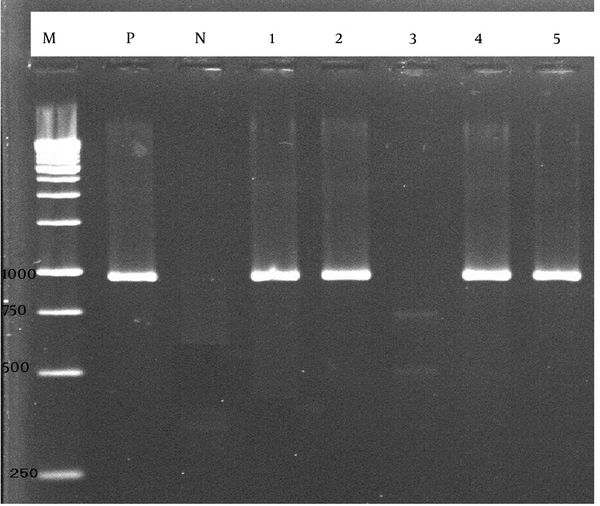 E. coli ATCC 29522 as the negative control and K. pneumoniae ATCC700603 (SHV), K. pneumoniae K5 (accession KF513160-CTX-M-15) and K. pneumoniae 7881 (TEM) were used as positive controls. The PCR purification kit (Bioneer Co., Korea) was used to purify PCR products and sequencing was performed by the Bioneer Company (Korea). The nucleotide sequences were analysed with the Chromas 1.45 software and BLAST in NCBI (8). This study was a descriptive-application. For analysis of the results, the MINITAB16 software was used. P value and confidence intervals were < 0.05 and 95%, respectively. The samples were from 100 (100%) patients from the Children Medical Center, Tehran, Iran and belonged to 12 males (12%) and 88 females (88%). The number of E. coli strains isolated from patients was 100 followed by 35 (35%), 50 (50%) and 15 (15%) in the age group < 1 year, 1 to 7 years and 8 to 14 years, respectively. The isolates were obtained from urine samples. Fifty one (51%), 24 (24%), 0 (0%), 25 (25%), 2 (2%), 6 (6%), 2 (2%), 79 (79%), 7 (7%), 36 (36%) and 43 (43%) E. coli isolates were resistant to cefotaxime, ceftazidime, imipenem, gentamicin, amikacin, cefepime, piperacillin/tazobactam, co-trimoxazole, nitrofurantoin, cefixime and cephalothin, respectively (Table 1). The existence of blaTEM and blaCTX-M was detected in 69 (69%) and 74 (74%) isolates, respectively (Figures 1and 2), while blaSHV gene was not detected (Figure 3). Sequencing of PCR products showed conserved regions for the restriction sequence of blaCTX-M-15 and blaTEM-1 genes, which were confirmed by BLAST in NCBI. 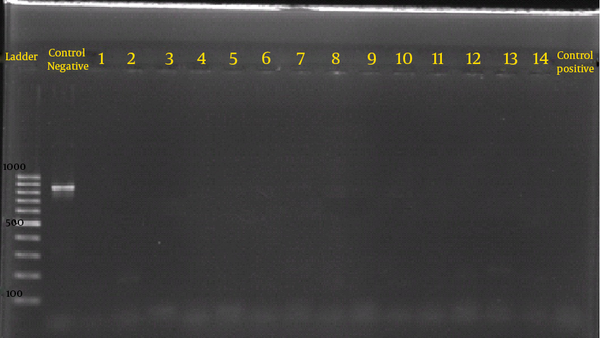 Lane M: DNA size marker; Lane P, K. pneumoniae K5 (accession KF513160) Positive control. Lane N: negative control. Lane 1, 4, 6, 7, 9, 10: CTX-M positive isolate. Lane 2, 3, 5, 8: CTX-M negative isolate. Lane M: DNA size marker. Lane P: K. pneumoniae 7881 Positive control. Lane N: negative control. Lane 1, 2, 4, 5: TEM positive isolate. Lane 3: TEM negative isolate. Lane M: DNA size marker. Lane P: K. pneumoniae ATCC700603 Positive control. Lane N: negative control. The nucleotide sequence data reported in this paper have been submitted to the GenBank sequence database and assigned accession numbers KF723592, KF723591 for blaCTX-M-15 and KF990597 for blaTEM-1. Antibacterial resistance significantly increases children morbidity, rates of hospitalization, costs of treatment and use of broad-spectrum agents (9). Emerging antibacterial resistance rates and ESBL-producing Escherichia coli recovered from UTI is an increasing problem in different regions, limiting therapeutic options (1). Resistant Escherichia coli isolates are associated with decreases in clinical surveillance rates (9). The lowest rates of resistance in isolates were observed for imipenem 0 (0.0%), amikacin 2 (2%), and piperacillin/tazobactam 2 (2%). The highest rates of resistance were observed for co-trimoxazole 79 (79%), cephalothin 43 (43%) and cefixime 36 (36%). In many countries, cephalosporins such as cefotaxime and ceftazidime are the antibacterial agents of choice for the experimental treatment of UTI and there is much evidence suggesting a relationship between antibiotic resistance and prescribing habits (1). Among bacterial isolates from children with UTI in this study, resistance to imipenem was the least. This might be due to the limited usage of these drugs in our population (1). The increasing frequency of co-trimoxazole resistance is worrisome. The prevalence of resistance to this antibiotic has increased during the past decade. In a study, the resistance rates of 50% and 62% to co-trimoxazole were detected in Tehran, Iran. The high resistance rate in this study seems to be result of widespread co-trimoxazole usage of families even in the absence of prescription (1, 10). The spread of antibacterial resistance among pathogens in Iran hospitals has emerged as an important challenge. The most common cause of resistance to cephalosporins in Escherichia coli is the production of ESBLs. Twenty-four of ESBL producing E. coli were resistant to cefotaxime and ceftazidime, simultaneously. The emergence of ESBLs among E. coli has increased worldwide (11). In our study, the existence of blaTEM, blaSHV and blaCTX-M was detected in 69 (69%), 0 (0.0%) and 74 (74%) of isolates, respectively. This is worrisome, especially in Iran where ESBL prevalence is very high. In the past decade, blaCTX-M gene has replaced blaSHV and blaTEM genes in Canada, Europe, and Asia as the most common ESBL type in these bacteria (12). The CTX-M ß-lactamases are now widespread in both nosocomial and community-acquired pathogens (12). In our study, TEM-1 and CTX-M-15 type ESBLs were predominant. The blaTEM gene has a high frequency compared to blaSHV gene; a finding, which is similar to previous studies, but different from the results reported in other researches (13, 14). Also, in this study, the blaSHV gene was not found in ESBLs producing E. coli isolates. Therefore, the extension pattern of blaCTX-M, blaSHV and blaTEM genes in isolated E. coli is also different in various parts of Iran. Pakzad et.al showed that, 26.1% (n = 11) and 95.2% (n = 40) of the isolates harbored blaSHV and blaTEM, respectively (13). In a study, ESBLs producing E. coli had 69.2% blaSHV, 85.6% blaTEM and 53.8% had both genes that were higher than our results. In another study, the ESBLs producing E. coli were also positive for blaTEM (32.4%) and blaSHV (52.7%) genes; and the frequency of blaSHV gene was higher than blaTEM gene, which was different from our results (14). The prevalence of ß-lactamase-producing isolates, and their isolation from life-threatening infections, is increasing at an alarming rate worldwide. Intensity pressure for usage of antimicrobial drugs in children results in eradication of normal flora and situation of MDR isolates substitution. It was shown in this study that ß-lactamase producing E. coli strains are an emerging threat in hospital departments and should be supervised by implementation of timely identification and strict isolation methods that will help reduce their severe outcomes and mortality rate in these patients. We would like to thank the personnel of “Children Medical Center” and Microbiology department of Shahid Beheshti University of Medical Sciences for their cooperation. Implication for health policy/practice/research/medical education: The prevalence of beta-lactamase-producing genes in E. coli detected by this study is of great concern and highlights the need of infection control measures including antibacterial management and prompt identification of isolates with beta-lactamase-producing genes. Authors’ Contribution: The core idea of this work came from Dr. Hossein Goudarzi, who also conducted the project as part of his dissertation. Mrs. Shadi Aghamohammad collected the data, cultured and performed the molecular tests and also wrote the manuscript with the help of Dr. Ali Hashemi and Mrs. Noori. Dr. Nikmanesh helped in sample collection. Funding/Support: This work was financially supported by the Microbiology Department of Shahid Beheshti University of Medical Sciences, Tehran, Iran.